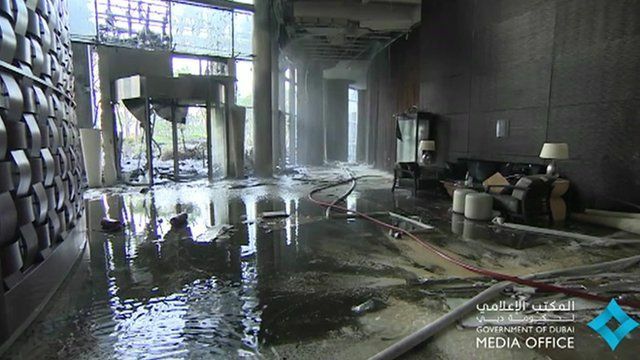 Inside Dubai's fire-damaged hotel Jump to media player Footage showing the damaged insides of a Dubai hotel which caught fire on New Year's Eve is released by the authorities. Dubai hotel engulfed by fire Jump to media player The authorities in Dubai are trying to find out what caused a huge fire to engulf a 63-storey luxury hotel in the city centre on New Year's Eve. Huge blaze tears through Dubai hotel Jump to media player A huge fire engulfs a high-rise hotel called The Address in central Dubai, with burning debris raining down on the streets below. Dubai blaze: 'I was never so terrified' Jump to media player Jazz singer Anita Williams, who was performing in the Dubai skyscraper which was engulfed in flames, described the ordeal. Footage showing the damaged insides of a Dubai hotel which caught fire on New Year's Eve has been released by the authorities. The Address Downtown hotel in central Dubai was engulfed in flames hours before the city's annual firework display. Investigations into the fire are continuing.